I’d like to introduce a new Widget called Dash Monitors that I’ve created in the past week or so for the Dashboard in Mac OS X Tiger. It’s been tested pretty extensively on the latest developer release of Tiger, but I can’t guarantee it will work on any later versions of Tiger as it’s possible that Apple will change the architecture of the Dashboard. If any readers here have a developer release of Tiger, give it a shot and let me know how it goes. The Gaucho Software page for Dash Monitors can be found at http://www.gauchosoft.com/DashMonitors/. Some people have had a problem with the amount of noise that the 2.5Ghz models make. Most of the time, the machine is really quiet, and I only hear a slight whooshing sound from the fans. However, there are times when the machine will start to heat up and when the fans kick in they are a bit loud. Of course “loud” is a relative term, and while I can see why some others have complained, the machine is much quieter than my TiBook is when it starts spinning its fan at “hair dryer” volume… 🙂 There is a difference in how long the fans make a lot of noise too. While the Powerbook fan will make a ton of noise for 5-10 minutes before cooling the Powerbook back down to a reasonable temperature, the G5 will spin up it’s fans for 10 seconds or so, and then they will drop back down to a medium level. Another shot of my desk from an angle. The subwoofer behind the monitor makes for some pretty balanced audio output, and I can’t even tell it’s there when sitting at my desk as the monitor does a great job of hiding it. Over on the Cult of Mac blog, check out what happens when you have a desk with a glass top and the glass breaks! I couldn’t imagine walking into my office to find that heap of a mess with all my hardware on the floor. 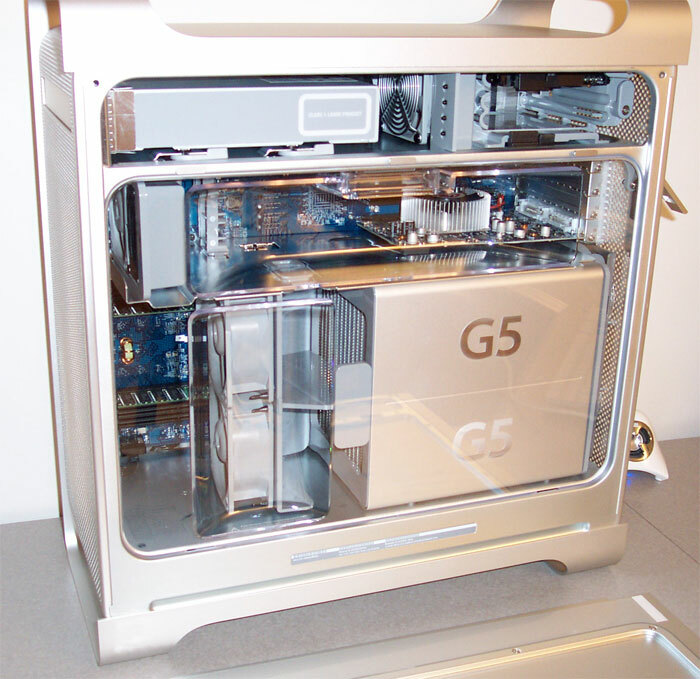 Speaking of hardware… 😉 Most of the pieces of my new G5 have arrived. 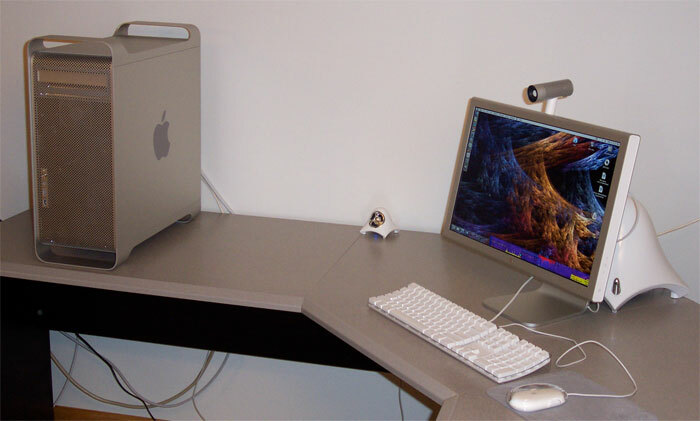 The Cinema Display, 1Gb RAM upgrade, the All-In-One, and the iSight adapter for the new monitor all came within a couple of days after ordering. The G5 itself is still on hold. They expect it to ship by 11/17, but who knows when it will get here. Of course with my luck, Apple has since added an nVidia 6800 GT to the configuration options and it’s only $40 more than the ATI 9800 XT that I ordered. I asked about changing my order, but they claimed it would delay delivery by 2-3 weeks. I figured the 9800 should be plenty fast and it probably isn’t worth the wait. Back in June, I posted on getting an Ultra 10 and commented on the lack of a freeware program today comparable to XEarth back in the day. Well, awhile back, I finally found one that has a beautiful display of earth with the option to download current cloud maps and locations of storms. The application is called OSXplanet, and it’s a GUI wrapper by Gabriel Otte of an open source project called Xplanet. The first thing you notice when starting the app is how nice the imagery of the earth is. The texture used to map on the earth has a fairly high resolution, so it looks great even on large monitors. The option to download storm locations made tracking the recent hurricane season easy. It’s also cool to watch storms cross the US in the cloud map. Here’s a screenshot of it running on my Powerbook (covered slightly by a couple of other apps).